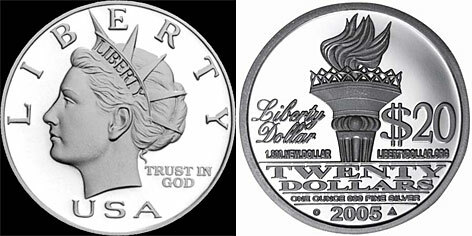 The Justice department has declared that it is a crime to use unofficial coins as legal tender. A group calling themselves NORFED (National Organization for the Repeal of the Federal Reserve Act and the Internal Revenue Code) has been producing and circulating Liberty Dollar coins for 8 years. The coins are made of silver and are also backed by stocks of silver and gold in a vault in Idaho. I'm not sure why you would have to back a coin with silver if it's already made with silver. That was typically done with currency instead. In any case, I'll be interested to see how this turns out. WASHINGTON — The government Thursday warned consumers and businesses that it is illegal to use alternative money known as “Liberty Dollar” coins, which organizers promote as a competitor to the almighty dollar. “We don’t want consumers to be fooled,” U.S. Mint spokeswoman Becky Bailey says, noting U.S. Attorneys offices across the USA have noticed a marked increase in inquiries about the coins. The coins’ producers vowed to fight the government’s decision. The coins are then spent by the group’s 2,500 Liberty Associates in stores run by fellow supporters or are accepted unknowingly by clerks who are unaware they are not receiving real money. The Justice Department has determined that use of Liberty Dollars, which come in varying denominations, “is a crime,” according to the Mint, which issued a rare public warning Thursday. “The United States Mint is the only entity that can produce coins,” Bailey says. The Mint notes the coins share some resemblances to real money, such as the term “Trust in God” instead of “In God We Trust” and use of a torch in the design. Such similarities may confuse people into thinking the money is real, the Mint says. “The designs and verbiage … are original and are not copies of any U.S. Mint currency,” NORFED Executive Director Michael Johnson said in a statement. It’s unclear how many people or businesses are unknowingly holding Liberty Dollars, which cannot be exchanged for real money at banks. In a case in Buffalo, a man and his son are set to go on trial next month after they knowingly tried to buy beer at a Buffalo Sabres hockey game with Liberty Dollars.